A couple weeks ago while I was in New York for the New York Times Portfolio Review, I got in touch with Bryan Formhals. We'd known each other through blogging about photography for years, but had never met in person. He's been doing a great podcast for the past couple years called The LPV Show and asked if I'd be interested in recording an episode. I had a pretty tight schedule with meetings, but the guys graciously got together on a Friday night and we talked about my recent political work and book dummy, blogging about photography, and a couple of great photobooks, My America by Christopher Morris and Will Steacy's Deadline. 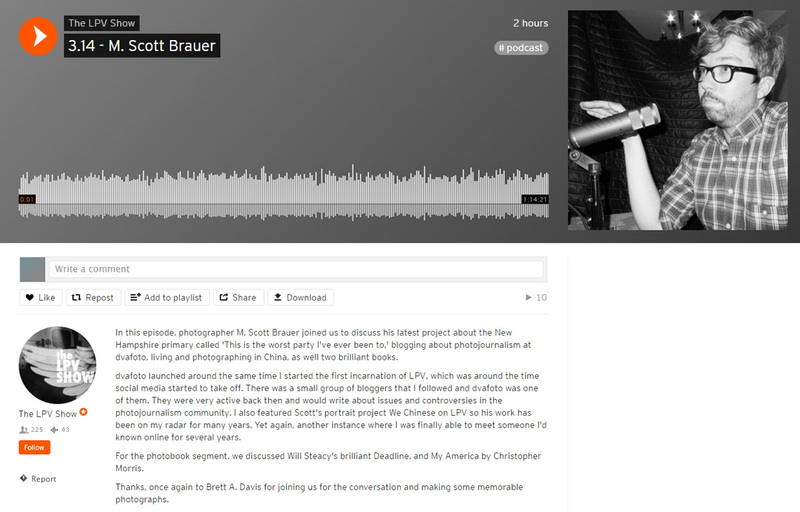 You can listen to the podcast on soundcloud or embedded on my website here. And on The LPV Show tumblr, there are some pictures of my book dummy, some behind the scenes pictures from when we recorded the podcast, and a few other posts about my work and the other books we discussed. This was my first time ever doing any sort of interview like this, so I was a bit nervous. A big thanks to Bryan, Tom Starkweather, and Brett A. Davis, for making the process so fun and easy and for giving me the opportunity to talk about the work. And thanks for the Mexican food! !